Well…..! 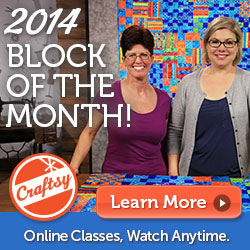 A free Block of the Month designed to teach you about color. Now I say this is pretty darn decent. Craftsy.com have managed to get Amy Walsh and Janine Burke to put together a video showing you color basics, color combinations, value contrasts, and something called hexadic color schemes. I had to look it up as I was as flummoxed as you! To teach you all this largess you get to make six blocks. If you don’t want to think about selecting fabrics then naturally (!) you can buy the Michael Miller kits directly from Craftsy. I’d say this is a pretty good deal!